YEREVAN (RFE/RL)–President Robert Kocharian and Foreign Minister Vartan Oskanian joined world leaders on Wednesday in congratulating Abdullah Gul on his election as Turkey’s president. Kocharian’s office did not release any details of what is a rare congratulatory message sent from Yerevan to Ankara. Kocharian, who is currently in Greece on a private visit, received an official congratulation from Gul’s predecessor, Ahmet Necdet Sezer, after his reelection in 2003. “There is much work to be done in this region, and I am sure you will bring your contribution to global peace and prosperity,” Oskanian said in a separate letter to Gul released by the Armenian Foreign Ministry. Gul repeatedly met with Oskanian in his previous capacity as Turkey’s foreign minister to discuss ways of normalizing strained relations between their countries. No major progress was made during the talks. Armenia and Turkey have no diplomatic relations, with successive governmen’s in Ankara making their establishment conditional on a resolution of the Nagorno-Karabakh conflict and an end to the long-running Armenian campaign for international recognition of the 1915 genocide in the Ottoman Empire. 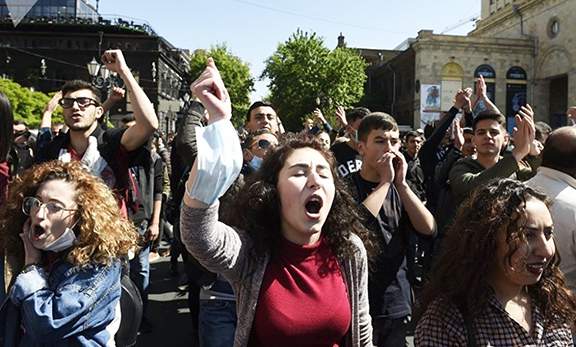 The current Turkish government, formed by Gul’s Islamist-leaning Justice and Development Party (AKP), has essentially stuck to those preconditions despite showing signs of a softening of Turkish policy on Armenia. Accordingly, few politicians and analysts in Yerevan expect a rapid improvement of Turkish-Armenian as a result of Gul’s election. Giro Manoyan, a senior member of the governing Armenian Revolutionary Federation (Dashnaktsutyun), also argued that Turkish presidents have had little say in the formulation of government policies. Manoyan further pointed to the volatility of the political situation in Turkey where the powerful military has been at odds with the AKP-led government and openly opposed Gul’s election. “One thing is clear: Armenia needs a stable and predictable Turkey,” he said.